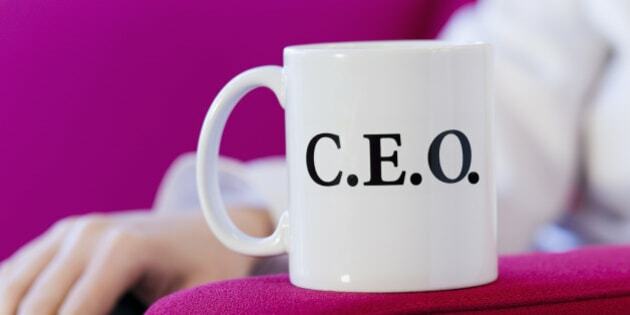 PricewaterhouseCoopers just released their 18th Annual Global CEO Survey, based on interviews with 1322 CEOs in 77 countries and the results were generally mixed about the future, with both a certain optimism along with an almost equal amount of reservation. First, the survey indicated that a notable amount of concern remains about the overall global economy. 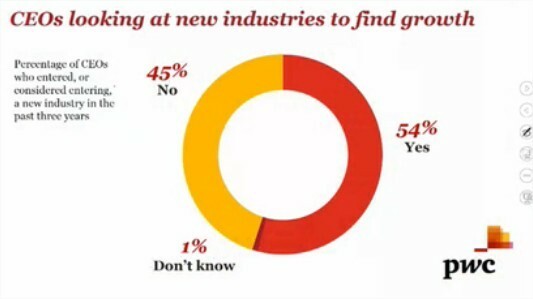 Only 39 per cent of CEOs believe the outlook global economic growth prospects will improve over the next 12 months, compared with 44% from its last year's survey, and 17% of CEOs believe the global outlook will worsen. Drilling down a bit deeper into their expectations, 61% of CEOs see more opportunities today than three years ago, but an almost equal number, 59%, see more threats. This apparent contradiction is partially explained by the regionalization of attitudes, as CEOs in North America, Asia Pacific, and the Middle East leaned more towards the optimism of growth opportunities and short-term business confidence levels, while CEOs in Latin America and Africa were more pessimistic in seeing the threats. Nevertheless, more than one-third of CEOs (39%) were very confident about their own business growth prospects in the coming year. 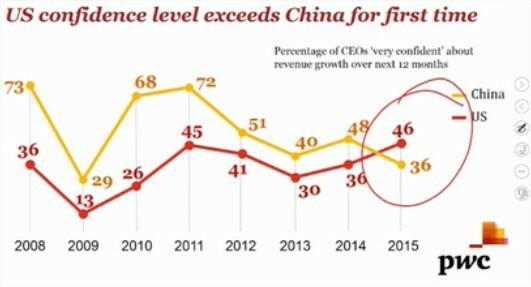 As for which markets reflect the best overall growth opportunities in the coming 12 months, the top of the list among 38% of CEOs turned out to be the US, rising ahead of China (34%) for the first time in five years. PwC attributes this to national GDP being 7% higher than before "the crisis," plus job growth, higher consumer spending, and energy surge from the fracking boom. Another surprise was that these were followed by several "mature" markets such as Germany (19%) and the UK (11%), ahead of the BRICS nations where complex structural and political issues hamper market growth. Australia even moved into the top ten nations for growth and France, Italy and Spain all moved up the ranks. Driving both market growth and challenges for CEOs is, of course, the disruptive nature of technological change, which impacts not just the nature of their products, but also how they relate to customers and suppliers, and even what new market sectors they decide to enter. Concerns about the impact of technology on their business actually raised anxiety among 58% of CEOs, compared with 47% in last year's PwC survey. CEOs see technology as enabling new competitors to exploit weaknesses in their businesses, with 32% naming technology as the sector from which significant competitors are emerging. Meanwhile, 15% of CEOs who have entered, or considered entering, into a new sector or sub-sector have chosen technology as the way to do it. One of the biggest driving forces is the spread of mobile technologies, which are revolutionizing the ability of customers to obtain information. With more than 4.5 billion mobile phone users in the world - nearly 70% of the world's population, access to information is changing the dynamics of how companies engage with their customers. Technology is also increasing the options for comprehensive data analytics, allowing companies to access, analyze and use information about their customers in improved ways. This is why 80% of CEOs cite data mining and analysis as strategically important to them. Not surprisingly, the top threats CEOs see in the coming year are government overregulation (cited by 78% of CEOs), the availability of the skills their companies need (72%), the failure of governmental responses to fiscal deficit and debt burden, (72%), geopolitical uncertainty (72%), a rising tax burden on corporations (70%) and even cybersecurity threats (61%). CEOs point to three key disruptive forces of their business that keep them awake at night. First are government policies - both national and international, where 66% of CEOs are concerned about future regulatory changes over the next five years. But increased competition as well as changes in customer behaviors were both cited by 61% of CEOs. CEOs do seem to be a responsive and forward lot, though. One-third say their company has entered new industries in the last three years, and more than half (56%) believe that their organizations will increasingly need to compete in new sectors within the next three years. Perhaps for this reason, 51% of CEOs will enter into new alliances in the coming 12 months, and 54% rank access to new technologies as their number one reason for partnering. The key principle that CEOs now recognize is the need to create value for their customers. They know they must create more engaging, personalized and continuous experiences for customers, which requires more customization, responsiveness and innovation. It also pushes on CEOs to ensure they have the talent they need, coming from a diversified workforce. In this regard, it's encouraging to see that 85% of the CEOs whose organizations have a diversity and inclusiveness strategy say they recognize how diversity has enhanced their business performance, while 56% say it's helped them compete in new industries or geographies.